The jump that won Yvette Williams a gold medal at the 1952 Helsinki Olympics was only 1 cm short of the world record held by Francine (‘Fanny’) Blankers-Koen of The Netherlands. Like Williams, Blankers-Koen was a versatile athlete, competing successfully in the long jump, high jump and a range of track events. Williams broke Blankers-Koen’s long jump record 18 months after the Helsinki Olympics at an athletics meeting in Gisborne. Her world record of 20 feet 7½ inches (6.29 m) stood for another 18 months. In 1999 Blankers-Koen was voted ‘Female Athlete of the Century’ by the International Association of Athletics Federations. 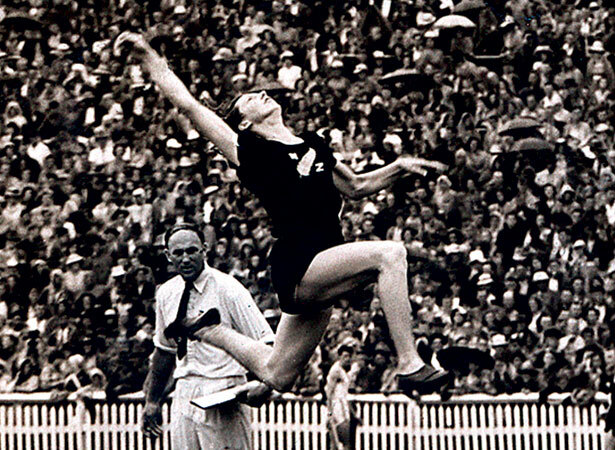 The athletics historian Peter Heidenstrom chose Williams as his ‘New Zealand Athlete of the Century’. We have 7 biographies, 1 article, related to Yvette Williams sets world long jump record.